Seed catalogues flooded my mailbox at the beginning of the month. There is one, from a company in Maine, which comes in the mass of mail right after Thanksgiving. I have never ordered from them and, because it comes so early, I'm not inclined to consider what I might be planting a full 6 months in the future. I have my favorite companies; Jung Seed, Park Seed and Select Seeds. I received a new catalogue this year, something from a nursery which specializes in prairie plants, which looks very intriguing. Other than these four, everything else has been thumbed through and discarded. You find companies you like and you stick with them. The same goes for nurseries. I go to Planter's Palette. I've been going here since the place opened and have watched them grow, specialize, diversify. I know, if I have an issue, I can go to them for advice. They told me what I needed to put in the raised bed to get good plants. The guy I spoke with also said, "Don't buy our top soil. It's overpriced. Go to Wal*Mart and get some of theirs. But, you'll need to amend that with our mushroom compost; one bag of compost to one bag of top soil. Next year, mix into the box more compost. The year after that, add top soil. Keep doing this and anything you plant in the box will thrive." I appreciate that kind of honesty. I did that and I think it's one reason the sunflowers in the box were gorgeous. I want to make the north side of the house, now that all the trash stuff has been removed, a bit more exciting. It's just the bare wall, foundation and the two pine trees which had their dead branches removed with the clearing of the brush. I thought adding a ground cover and filling the area with ferns and hostas would be a cool idea. Unfortunately, the cost of ferns and hostas means this has to be a long term project, but I could start with a couple. Well, what to start with. Planter's has an abundance, almost mind boggling, number of types of ferns and hostas. Big, little, with color, straight green, you name it. I was prepared to spend an hour wandering around the tables, looking at the varieties, reading about them, pondering, looking at what I was going to buy and deciding how much I could afford. It took me 15 minutes. 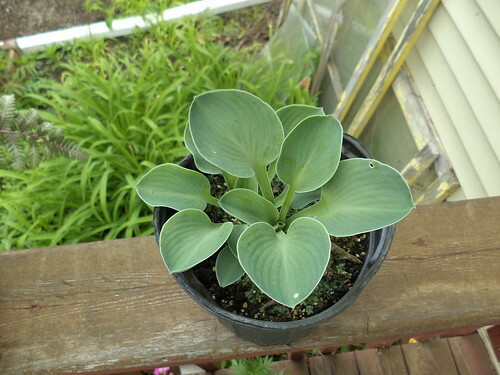 This hosta is called "Mouse Ears". You can see it, right? Here's the fern. Yes, while I was prepared to do some research and ask questions, I picked a hosta and a fern solely because they had cool names. The ground on the north side of the house is hard and compacted. I couldn't get the holes dug as deeply as I wanted to get these planted. I also bought some pachysandra for ground cover. I watered every other day and then we got some good soaking rains so I didn't check up on the plants for about a month. When I came around the side of the house, they had been eaten down to an inch above the soil line. 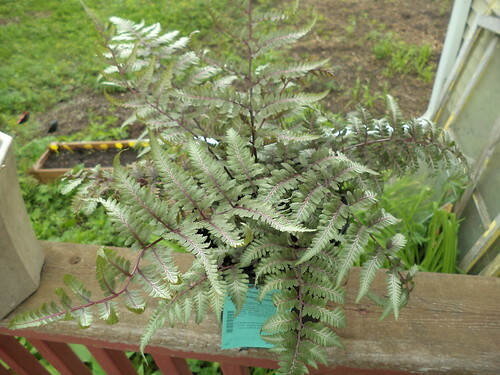 In October, however, the fern and the hosta had put out new bracts, which was encouraging. Over the weekend, when I rehung the bird feeder, they were nowhere to be seen, but I think they die back. My neighbor to the south has several large cinnamon ferns and those die away completely with the first hard frost. The pachysandra was still there. I did think that perhaps I need a raised bed on that side of the house. The creeping Charlie has taken over where I had scattered grass seed. I probably need to cover the ground with landscape fabric and let the sun's heat kill the grass and weeds under it. It's an old method of killing weeds in the soil. If I cover the creeping Charlie, that should, in theory, kill that patch and I could start anew with grass. I really wanted to put poppies on the north side of the downspout. I forgot to buy them last year. I love the look of poppies and used to have a couple plants in the front. There will be some landscaping changes this year. I'm not retiring and moving away, yet, so I want the lawn to look better than it has in years. I was quite neglectful.